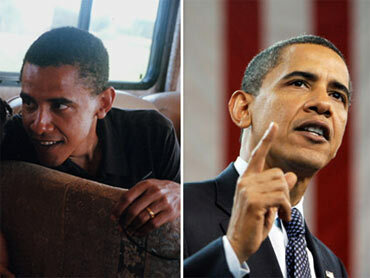 In honor of President Obama's 48th birthday today, we took a look at how other presidents have aged over the years. Take a look at how Mr. Obama and his predecessors have added some gray since they first entered the national scene here. For his birthday today, the president has no public events scheduled, but he does have a lunch at the White House with all the Democrats in the Senate, and independents Joe Lieberman and Bernie Sanders who caucus with the Democrats. White House spokesman Robert Gibbs said this morning that 57 of 60 are expected to make it (all but Sens. Ted Kennedy, Robert Byrd and Barbara Mikulski). It's a working lunch though, as they are likely to discuss health care and the "cash-for-clunkers" program. In yesterday's press briefing, Gibbs joked that Mr. Obama invited the senators to the White House on his birthday because "Chuck E. Cheese was booked." The Washington Post reports that Mr. Obama celebrated his birthday a couple days early at Camp David. He was joined over the weekend by his family and friends -- including Marty Nesbitt and Eric Whitaker from Chicago and several of his childhood friends from Hawaii. Mr. Obama played basketball at the presidential retreat and bowled. Gibbs said that he bowled a 144, according to the Post, which shows a marked improvement since he was ridiculed for a 37 ahead of the Pennsylvania primary last year.